It's been a couple of weeks since the Sewcial and I did make some progress on my projects. I took five projects with me and completed four! So what did I get done? I started this quilt SEVERAL years ago (I'm thinking early '90s) and had everything except the borders done. I managed to bring it up to 91 x 91 (before quilting) and am hoping it will fit my bed once it's quilted. It has a nice "vintage" look to it. This is a "Grab Bag Log Cabin". The pattern is an old free handout from Thimbleberries. All it takes is one jelly roll and you've got a great throw. I've made this quilt before from other fabrics and added a border to make it a bit bigger but I don't plan on doing that with this one. The fabrics are Kansas Troubles (I don't remember which specific line though). This baby quilted was started about 10 years ago. 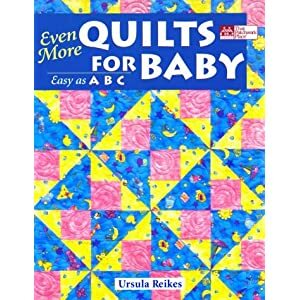 The pattern is from a book called "Even More Quilts for Baby". I had all the blocks done but needed to sew them together and then add borders. Not sure who will receive this one but it's a cute little quilt for a baby girl! Lots of great patterns (and easy too!) in this book. I didn't have a specific pattern for this one but had seen the quilt on the internet and recreated it in Electric Quilt. I started it several years ago and even worked on it at retreat but never got it completed. The star in the center is rather "bright" so I'm thinking once it's quilted, I may try and "age" just the center star to tone it down. I have some "Distress It" that I'm thinking of using to try and tone it down. I also recently completed one of the projects from the quilt retreat in January. I finished the quilt for my neice, Harper Grace. I freehand quilted a floral design all over the quilt. So, that's one projected completed and delivered to it's recipient. The tops I completed at the Sewcial will go into my "TO BE QUILTED" bin. In the meantime, have a great day and we'll see you back here soon! I'm going to be "Sewciable" tomorrow . . .